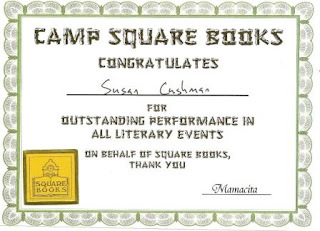 >I arrived in Oxford on Wednesday with my friend, Sue, just in time for Day 5 of “Camp Square Books.” Best summer camp I’ve ever been to! We got 10% off the author’s books, a free book bag and Square Books coffee mug. Mine has a quote from Flannery O’Connor that I love: Whenever I’m asked why Southern writers particularly have a penchant for writing about freaks, I say it is because we are still able to recognize one. 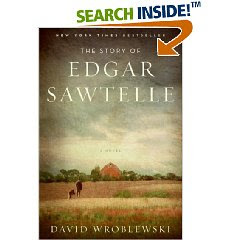 The author for Wednesday night was David Wroblewski, reading from his best-selling first novel, The Story of Edgar Sawtelle. We bought copies of the book to be signed and were just beginning to enjoy a glass of wine and crackers with cream cheese and Hot Pepper Jelly when my friend, Michael Risley (from the Yoknapatawpha Writers Group) and his wife, Jeannette, arrived. I was glad to see them, especially since they’ve bought a house in Florida, near Michael’s family, and plan to leave Oxford next month. We’ll miss our new friend but wish them well down in Gator land. Here’s Jeanette and Michael with Sue, waiting to get their books signed. What he called an old-fashioned preoccupation with place. 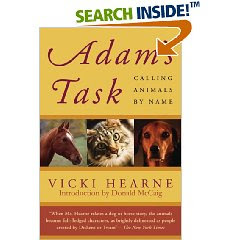 The book takes place in central Wisconsin, not an easily recognizable place. He creates the Sawtelle farm and sets it down on the border between the town and the Chequamegon National Forest… between “the wild world and the domestic world”—which he says will be a thematic tool in the book. So… this blog is a first draft… there’s so much to say in my letter home from camp that I took David’s advice and just dumped it all in here and stirred it up! After a fun evening of drinks and conversation about writing and publishing at City Grocery, with the author, and Richard and Lisa, Cody,Lyn, Scott, Sue, Patti, and others, Sue and I enjoyed a late dinner at Boure before heading back across the street to the Downtown Inn and Suites. Our first day at “Camp” did not disappoint. Now it’s Thursday morning and we walked across the street for a few hours of writing at High Point Coffee. Here’s Sue, working on a poem on the patio outside High Point. Such a good camper, doing her homework:-) It’s so nice to be able to walk everywhere we go during “Camp”…. Since all the events and free-time venues are right here, around the Square. 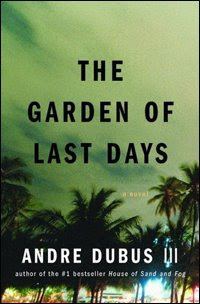 After lunch with Patti and a swim at our hotel, we headed back to Off Square Books for Andrew Dubus III’s signing and reading from his book, The Garden of Last Days. Dubus is the author of the best selling book (and movie) The House of Sand and Fog, but I had heard of him from his cousin, the author DeLauné Michel when I met her at Lemuria Books in Jackson and again at Davis Kidd in Memphis last month. You can read about that experience on my blog post of June 12 and June 18, if you missed them the first time. He set up the novel for us by telling us that it takes place in 2001 on the Gulf Coast, and “stars” a stripper named April, a single mom trying to make ends meet by stripping while raising her daughter. He contrasts her life with that of the terrorists who arrive in Florida prior to 9/11 and visit the strip joints. Dubus lives in Boston, near a man who was on one of the planes hijacked by the terrorists. He knows the widow and drives past the house frequently. But he also researched heavily, reading the Koran, the history of Saudi Arabia, and several books about 9/11, including The Looming Tower. He read The Battle for God by Karen Armstrong, which deals with the history of fundamentalism. And then he spent five years writing the book. The job of the writer is not to judge but to seek to understand. I was interested in his discussion about what he called “the difference in making something up and imagining it… The revision process is about finding the difference between those scenes and cutting the ones you made up. You can listen to Andre reading from his book on NPR here. And the three of us together after the reading. and here she is, signing my Camp Square Books Certificate. You can see her name on the bottom of the certificate, here (left.) Mamacita and I had a nice visit both nights. On Thursday night after drinks on the balcony at City Grocery (again) Sue and I had dinner at Waltz, a fairly new restaurant on the square. Later we met back up with Patti at Proud Larry’s for several hours of great music by Aaron Hall, one of the bartenders at City Grocery. Aaron writes most of his own music, and the band has a CD coming out in the fall. He got a nice review in the Oxford Music Snob. His My Space profile tags him as “soul, Italian Pop and Christian rap” but I would have also said blues and soft rock. But what do I know? He lists Ray Charles as his first influence. My favorite song was, “All I want is you to dance to my music,” which lots of folks did, (dance to his music)… but NOT ME. Patti, Sue and I had a great time on the front row watching the fun. Of course Aaron and the drummer (you can’t seem him in this pix) are both just 23… younger than my youngest child. The crowd was mostly 20s and 30-somethings, and at one point Patti turned to me and Sue and said, “I bet a lot of folks in here look at us and think we’re mothers of the band members here to watch our children play!” Thanks a lot for the reality check, Patti! So, that’s my letter from Camp… oh, and I forgot to mention how fun it was to sit with Beth Ann and Tom at the reading Thursday night, and to visit with Richard Wednesday night, and with Scott both nights. What a great bunch of folks. I think I can speak for Patti, Sue, Michael and myself when I say we were definitely Happy Campers! Can’t wait ‘til next year! P.S. A note about my favorite Camp Food: Fried Mashed Potato Smiley Faces at Boure’s! Yum!